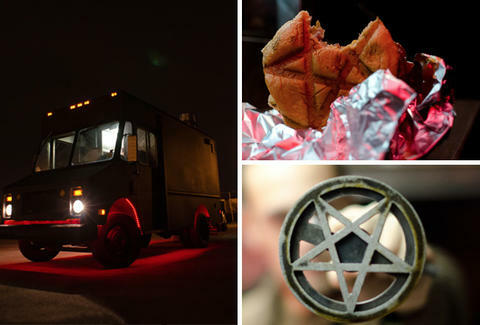 Because a steady diet of regular burgers would have you praying at the porcelain altar, hit up 666 Burger: a heavy metal Satan's spawn of a food truck dishing out eats so insane they may not even be legal, which isn't all that surprising once you've glimpsed its ominous, all-black body hauntingly aglow with red lights. Dealing out a range of arterial damage, everyday offerings run from the standard brisket/short rib/sirloin 666 Burger, to its spicier, Cajun-esque brother The Beelzeburger, to the steakhouse-inspired, no-cheese-allowed Satan burger with a middle made of pure butter, which the owner says "explodes like a steak c***ing down your throat", in spite of everyone telling him not to say that. However, those all bow down to the Douche Burger, a $666 edible fiscal disaster that piles caviar, lobster & truffles on top of a foie-stuffed, gold-leaf-wrapped Kobe patty, smothers it with Gruyere melted with Champagne steam, and finishes it off with BBQ sauce made using Kopi Luwak coffee that's passed through the digestive tract of the Asian Palm Civet, explaining why it "may not taste good, but will make you feel rich as f*ck". And should you need to chill out after blowing all that steak cash, they're pouring beverages infused with that most confusedly semi-legal herb, kava, promising that one will get you "real nice", and two will "f*ck you up", though no more so than reading about these burgers.